I just made the most delicious chicken salad for lunch. I receive a coupon in the mail from Arby’s for their market sandwiches and I saw the chicken salad sandwich. I thought to myself, I can make that salad. And for the last three days, I’ve had a craving for it. I had a can of chicken, celery, and pecans in the kitchen. All I needed were the grapes and apples. This salad would be great for entertaining for a baby or bridal shower or just having some girlfriends over. Add some crackers or little slices of french bread; a fruit, relish, vegetable, and/or cheese tray with a pitcher of Sangria and you are good to go. 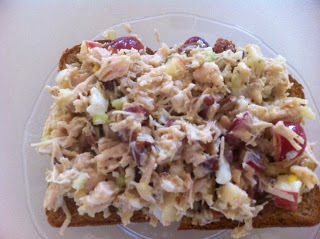 In a bowl, add chicken, apples, grapes, celery, pecans, and eggs. Mix the ingredients together. Add dressing and mix until incorporated. Add a little freshly ground pepper. No need to add salt as there is enough sodium in the canned chicken and there is salt in the dressing. You are ready to eat. Serves about 4.